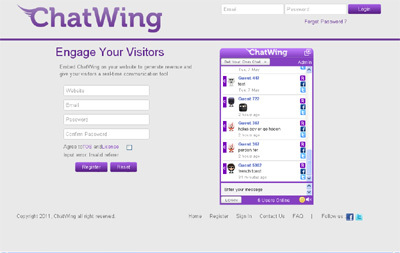 Chatwing offers a free website chat tool for any website or blog. Sites have the ability to see the live number of users online. Users can login with Facbeook, Twitter or as a guest. The ability to chat in real-time and interactive with other website visitors allows Chatwing to be the best free chat widget online. Chatwing offers Facebook and Twitter integration for the live chat experience. Also the Chatwing admin features allow website admins to closely control the chat conversations with live message delete functions.